Dog leashes are a critical piece of equipment for any dog owner. Designed to keep pets safe and under control, leashes come in a variety of styles to suit any breed, size, and temperament. There are several styles of dog leashes available. To choose the best design, a dog owner should consider their pet's needs, such as the animal's disposition, size, comfort on the leash, and the purpose for using the leash. Standard, fixed-length leashes are the most common. They may be made of leather or nylon, often with reflective patterns for nighttime visibility and safety. The standard length is six feet, though there may be variations, particularly for very wide or very narrow leashes that are intended for large or small breeds. Retractable leashes are popular alternatives to standard leash designs. 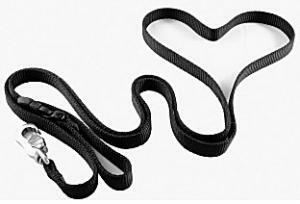 These wind-up leashes have cord lengths from 2-26 feet depending on the manufacturer. The retraction option prevents tangling and aids control by keeping the dog within an adjustable distance depending on the circumstances. No matter which type of dog leash an owner chooses, they should opt for the one that best suits their intentions and can safely and comfortably accommodate their pet. Not every type of accessory is appropriate for every dog. 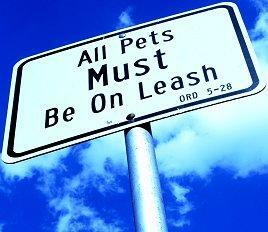 An owner must choose the best leash based on how they plan to use it and which features best suit their pet. The first step in proper leash use is to fit the leash to the animal. Dog leash manufacturers will state weight recommendations for different sizes, but the general rule of thumb is that smaller dogs use narrower leashes - the narrower the leash, the lighter it will be and the less distressing it will feel to the animal. Many dogs naturally pull against leashes and training is necessary to familiarize them with how to use a leash. Standard, non-retractable leashes are the best for preliminary training. When first using a leash, allow the dog to sniff and examine it before attaching it to the animal's collar. Never allow the dog to lead themselves by biting the leash, and do not permit them to drag it from their collar. The leash should be slack enough that they have some freedom of movement, but not so loose that it touches the ground and presents a tangling or tripping hazard. Start leash training with short walks in familiar areas such as a backyard or neighborhood dog park. As the animal grows more accustomed to the leash and is comfortable with it, you can explore new areas confident that your pet is secure. Dog leashes should be examined periodically for stretching, fraying, rips, rusty buckles, or other weak points that could break when a dog pulls in excitement or fear. If a leash becomes wet, dry it with a towel as much as possible and allow it to fully dry before being stored. If the reflective embellishments become worn, it is time to replace the leash. A proper dog leash is an essential tool for dog owners. Though there are many different styles, colors, and lengths of leashes as well as optional accessories, the most important characteristic they all share is the ability to keep your pet safe and secure. Dogs should be trained to use a leash properly so they are familiar and comfortable with it, and leashes should be cared for so that they do not become weak or dangerous. By following these sensible precautions, both the dog and the owner will enjoy walks with that leash for many years.